A bid to cut the speeding traffic along Prestwick Road and Oxhey Drive had been launched. For many years, residents have complained about the way cars zoom from The Woods onto the estate. Your local Labour team has listened to your concerns when you have told us that ‘something must be done’. We have pressed for action and plans have now been drawn up by Hertfordshire County Council’s highways experts to tackle this long-standing problem. Crucially, these plans have the support of the local police. Your Labour team have a good track record when it comes to improving road safety with the new traffic light controlled crossing which replaced the old zebra crossing opposite the shops in Prestwick Road where two school girls were knocked down and new speed warning signs due to be installed in Hayling Road any day now. We’re secured a public consultation on new plans to cut speeding, but nothing will happen unless you support it. Speeding in South Oxhey often starts when traffic having hurtled through The Woods at 40mph or more zooms onto the residential parts of Prestwick Road and Oxhey Drive. By this stage, drivers are going downhill and they don’t bother to slow down because there is nothing to remind them to do so. The existing 30mph speed limit starts way too far back from the entrance to the estate – right back at the junction with the A4125 (Sandy Lane). That’s what causes the speeding issue here at the moment. Highways experts, having studied the problem and have come up with a solution having ruled out installing speed cameras. There has been some misunderstanding of what is proposed following an article in the local press which failed clearly explain the plans. Making things safer is what this is all about. Highways bosses recommend that the start of the 30mph limit is moved nearer to the end of The Woods just before you get to South Oxhey. 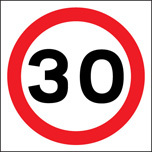 In addition, they believe that installing ‘gateway’ features highlighting the 30mph limit at these points will serve as a warning to drivers to cut their speed. Schemes like this have been successful elsewhere in many locations. They are tried and tested. We want to make things safer for everyone in South Oxhey and want you to make your views known: Please write to: Hertfordshire County Council, PO Box 153, Stevenage, SG1 2GH, or email to tro@hertfordshire.gov.uk marking your reply ‘The Woods Speed Limit Atlerations’. Responses should be with them by 8 March.